I found some swatches in the vault that I haven't shared yet! Woo hoo! The only down side is they are so old that I was using a whole different camera/lighting setup and my white balance was a bit off... So these look different from my usual pics. But I don't mind, and you shouldn't either. :) They're still lovely swatches, and they're making me want to dig these polishes out again to use as some bases for stamping! Yessssss. 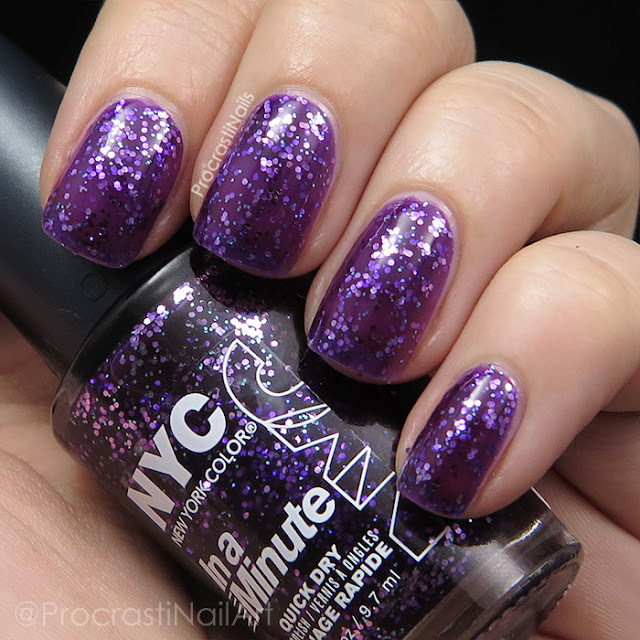 First up we have NY Princess which is a grape purple jelly packed with medium purple and small blue hex glitter. 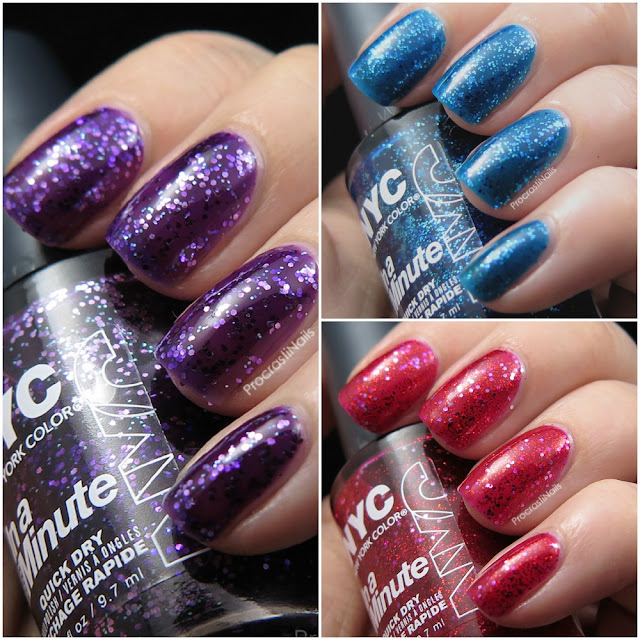 Pictured here is three coats with one coat of New York Color Grand Central Station (not technically a top coat but rather a clear polish - but works perfect as a top coat!) on top. I found it built up quite well, though since it is a jelly there is still a bit of visible nail line even with three coats. 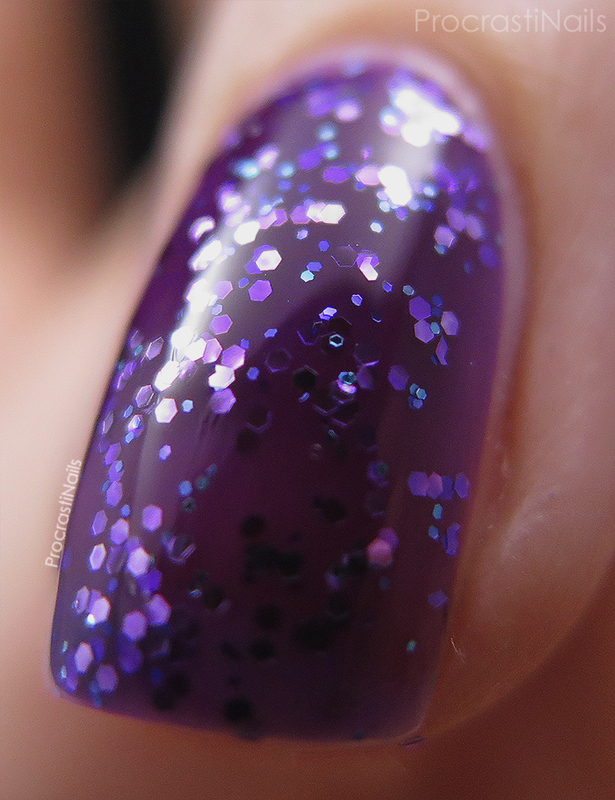 I really don't mind though, I adore how this looks on the nail! It applied really well, no issues there. 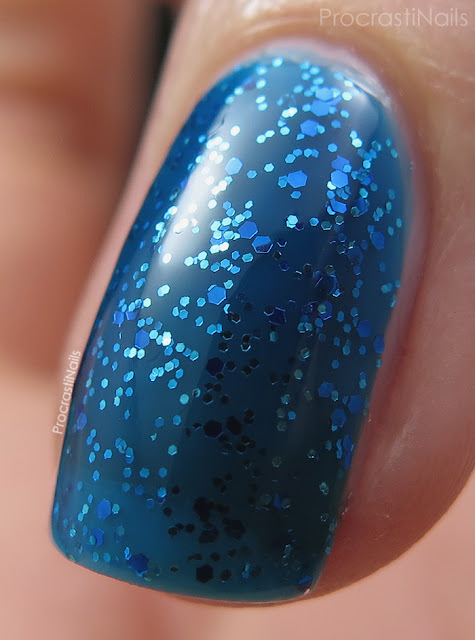 I don't eat pie, but this polish somehow reminds me of blueberry pie! So squishy and sweet! 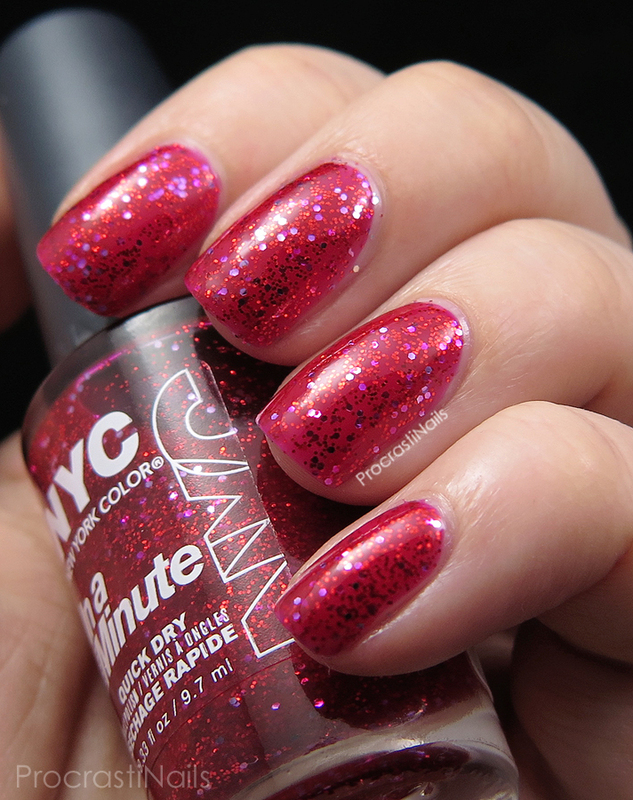 Next up is Ruby Slippers! 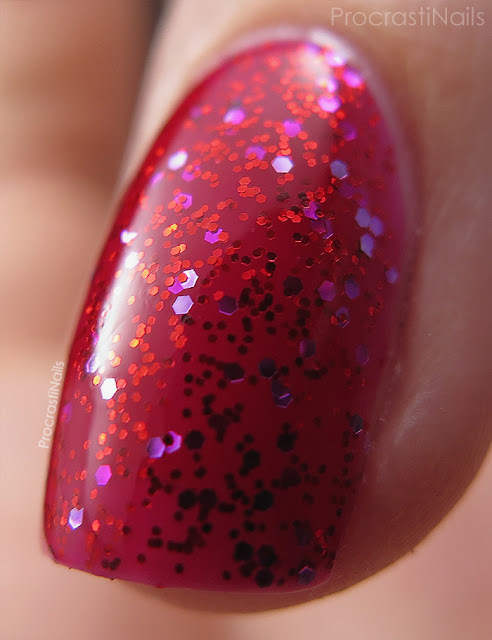 I feel like most lines have a red glitter that they call Ruby Slippers (or some variation) but this one is a bit unique. In addition to the fact the base is a magenta-leaning red jelly, the glitter it is full of is made up of both small red hexes and medium pink hexes! I know you aren't supposed to pair red and pink but it really works here! 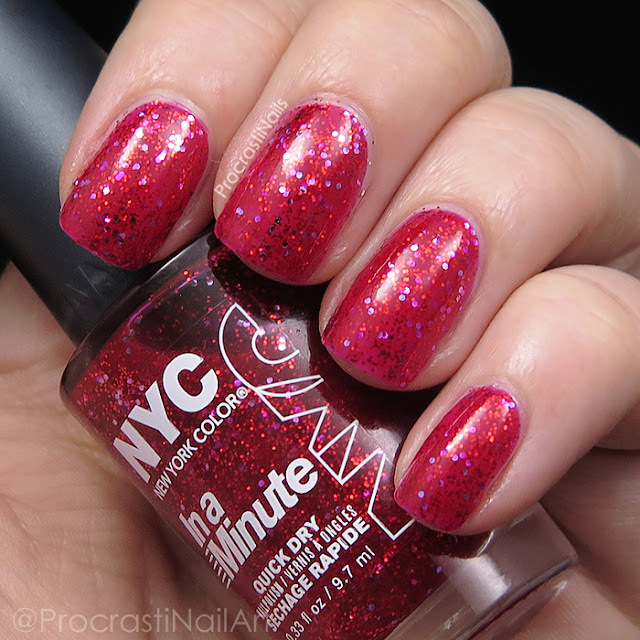 Once again I used three coats with one coat of Grand Central Station on top. The coverage on this one is a bit better than the purple and I had zero issues with application. Pretty! And somehow perfect for both Christmas and Valentine's Day, I think! 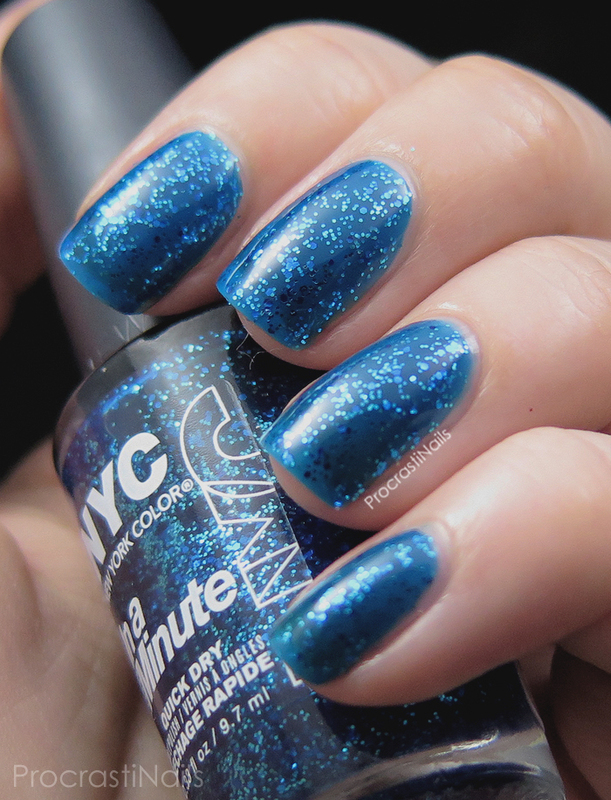 Last but not least we have Sea of Diamonds which is a bright blue jelly with small and medium blue hex glitter. I like this one, but I would have to say it is my least favourite from the set. (Though I do still like it! It's just in third place! lol.) It's very pretty but there is nothing too unique about it. Again this is three coats with one coat of Grand Central Station on top and there is still a bit of visible nail line underneath, as is expected with a jelly. No issues with application. I'm blue da ba dee... Is that joke old yet? Haha. All of these shades applied really well and at $1.99 you really can't go wrong in terms of price. 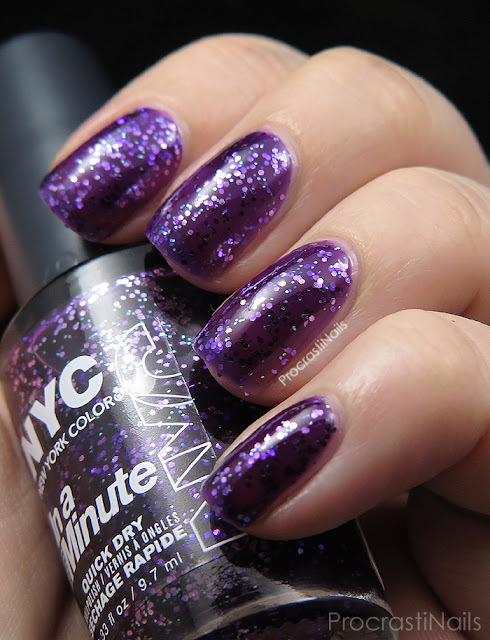 I don't own many New York Color polishes but that might have to change now! Do you own any New York Color polishes? How do you feel about these three? Yes, they have just the right amount of glitter I feel! And you can't go wrong with that price, especially for how pretty they look on the nail! They all look really nice. I don't own a lot of jelly polishes so they might be something for me to check out too. I have recently become obsessed with jelly polishes... I think it was all the sheer tinted polish collections that came out this year, they really sucked me in! They look so squishy! Love jelly polishes! Hmm, I'm not sure about these, they look a bit.. simplistic? These are lovely! I'm a huge fan of NYC! These are really pretty. 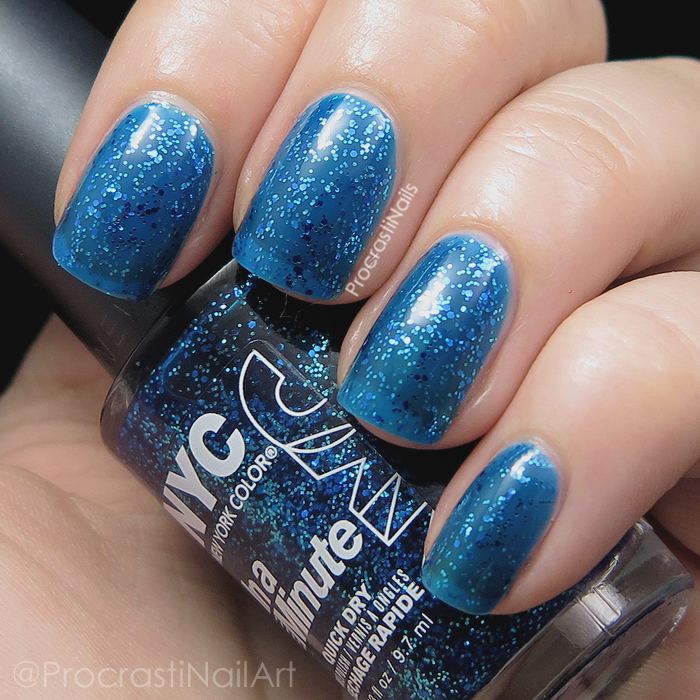 I wish there was a bit more coverage with the glitter after 3 coats though. Ohhh, these are so pretty!! Beautiful macros! You really captured these.